Lately, I’ve had my dream place on the mind again. In fact, everyone in the family has been talking about their “dream” place. It’s not that we have a hard time hanging out with each other, Not at all. It’s just that we each want a place of our own. A place that we can retreat to. I think that this longing is something that is hardwired into our nature. My wife would like to redo the master bedroom and bathroom. My oldest son wants me to finish out part of the basement so he can establish his lair down there. My daughter would like to expand her room into a portion of the unfinished attic so that she could have her own private hangout zone. And my little one is still on a treehouse kick. One with zip lines, trap doors and direct TV of course. Me ~ I want to go a little bigger. Always do. For as long as I can remember, I have been enamored with the concept of building accessory structures on a site. Whether you’re looking for a unique office space, an art studio, a reading / relaxation room or a true guest house, nothing compares to a complimentary, smaller scaled auxiliary building. Nothing can compare to how they enhance the overall complexion of the property. Just take the stand alone pool house for example. 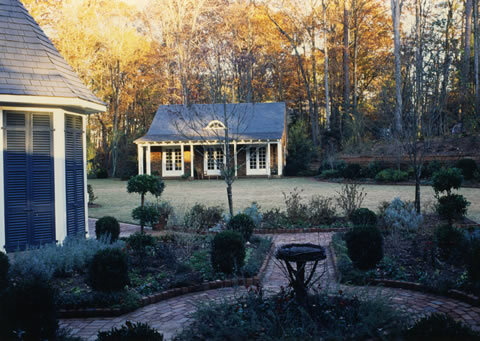 In this scenario, we have a beautiful structure that was a part of a collaborative project between Norman Askins Architecture and Bonner Custom Homes. Not only is the building a classic, but it is incredibly strong in substance. It is grounded to its setting and speaks volumes to its essence of permanence. The scale and proportion are perfect and its nature is very inviting. 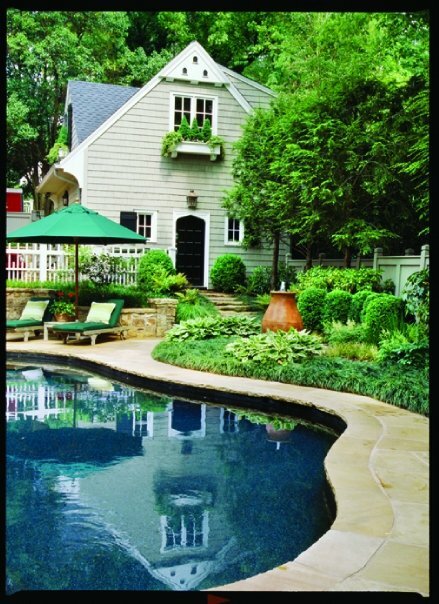 Beyond all of these classical elements, consider the dynamics that the pool house adds to the whole outdoor experience. Can’t you just see the kids hanging out playing a game of cards while taking a rest from swimming. Or having the football game on in the background as Dad is manning the grill. How about Mom and her friends talking for hours under the canopy. Or even how a party will extend deep into the evening as guest continue to linger around; wrapped up in conversation. I love this guest house that was a part of a Land Plus Associates project. 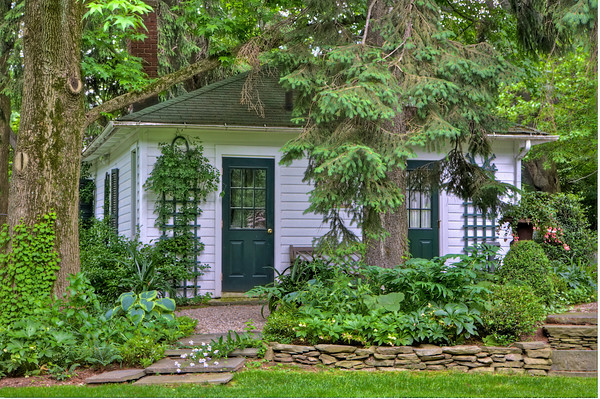 Not only is the home quaint and artistic, but it fits perfectly into the setting. I have long been a proponent of incorporating a landscape architect into the project from the initial conceptual drawing stage. Far too often, they are treated as an after thought. Being brought in on a project after the building contractor has already left and then they are having to work with what they have been dealt. As you can see, the siting of the house along with the layout of the grounds creates a harmonious composition allowing for a very comfortable result. If we ever let my mother stay in a place like this for even a day, I doubt if we could ever get her to leave. It’s that good. Here we have another spectacular auxiliary building by Bonner Custom Homes. Talk about a true gentleman’s quarters. 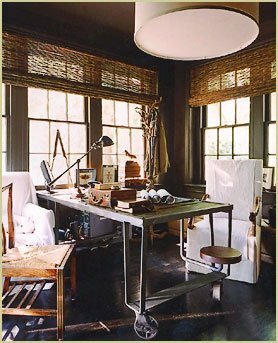 Couldn’t you see this as the perfect home office for the man who has the flexibility of running his enterprise from the house and yet who needs to have the space to truly set up shop. I can see a trader, a writer or an entrepreneur striding across the lawn at 7AM, coffee in one hand, stack of folders in the other. Determined to once again make something happen. I believe that this one came from the collection of Rod Collins Photography, however, I can’t say that for sure. Forgive me for my lack of certainty here. A while back, I stumbled upon this photo and have hung onto it ever since as a source of inspiration. When the day comes that I finally get around to building my own home studio office, it will definitely have a strong resemblance to this image ~ only slightly larger. I long for the day when I have a place such as this where I can carry out the everyday tasks. Whether it’s studying over architectural drawings, coordinating job site activities, developing future projects or even sitting down with prospective clients. Then again, maybe I’ll just be relaxin’ with some more casual endeavors such as writing, reading, learning or dreaming. Either way, it’ll be a place where the day is primed to go and make something happen. In case you’re wondering, the interior will probably feel a lot like this. Feel Free to E-mail, Friend or Follow. And, as always, I’d love to hear your thoughts. Please leave a comment below. We always wanted a compound of modest buildings that grow with family needs over generations. Tough to do in Atlanta but not impossible. You’d hope to do a house that will be lovable and flexible for generations. I could’t agree more, Terry. These are definitely easier to pull off when working with estate lots, however, some of the best ones I have ever seen are in the intown setting. Whoa, these are awesome. Here again, the lanscape is key to bringing the whole compostion together.